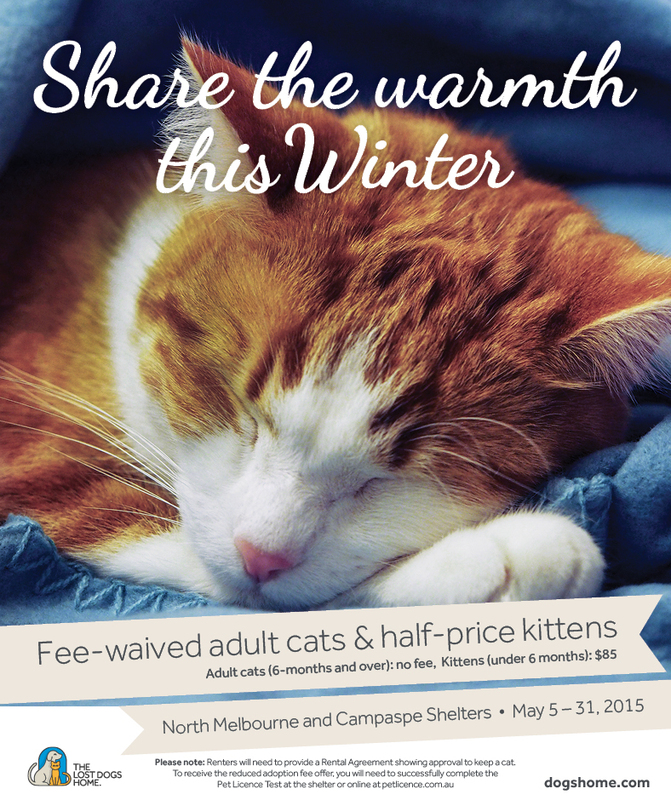 In May we called out to you to help us find homes for the large number of cats and kittens in our care across our North Melbourne and Campaspe shelters. Thanks to your generous support, 267 loving cats and kittens spent the first days of winter with their new families. However, we still have a large number of cats and kittens looking to Share the Warmth this winter. Could you be the new family they are looking for? Due to the large number of magnificent moggies currently available for adoption, we are extending our Share the Warmth campaign. From now until the end of June we are waiving the adoption fee for cats six months and over and halving the adoption fee of kittens under six months. Can’t adopt? That’s okay. You can still help us find homes for the wonderful cats and kittens in our care by applying to become a foster carer or advocating for our adoption candidates with your social networks. Adopt:View our terrific range of cats and kittens at dogshome.com/cat-adoption/. Visit your nearest shelter to meet them in person — our staff are keen to find you your perfect match! Foster:We need fosters to care for cats and kittens for an average of two to four weeks. This is a terrific way to give a cat time out in a normal home environment, while creating vital space at our shelters. All expenses are covered and successful applicants will be notified within two weeks of applying. For more information visit our foster care page. Advocate:If you cannot adopt, why not advocate for a cat currently seeking a home? Share adoption candidate profiles via your Facebook page, email or via the good ol’ word of mouth!